The Phoenix lander bound for Mars is hauled to Cape Canaveral's pad 17A on July 23 for installation atop the Delta 2 rocket that will propel the craft on its cruise from Earth to Mars. The Dawn spacecraft is returned to a processing facility to await a new launch date. The mission was delayed from July to September, prompting the craft's removal from the Delta rocket at pad 17B. This highlights movie from the July 23 station spacewalk shows the jettisoning of a support platform and a refrigerator-size tank. Members of the upcoming space station Expedition 16 crew, led by commander Peggy Whitson, hold a pre-flight news briefing. This is a preview the planned July 23 EVA by members of the space station crew to jettison two objects from the outpost and perform maintenance. Officials for Endeavour's trip to the space station present a detailed overview of the STS-118 flight and objectives. Four spacewalks are planned during Endeavour's STS-118 assembly mission to the space station. Lead spacewalk officer Paul Boehm previews the EVAs. A discussion of NASA's educational initiatives and the flight of teacher Barbara Morgan, plus an interactive event with students were held in Houston. A preview of NASA's Phoenix Mars lander mission and the science objectives to dig into the arctic plains of the Red Planet are presented here. Project officials narrate animation of Phoenix's launch from Earth, arrival at Mars, touchdown using landing rockets and the craft's robot arm and science gear in action. Jim Green, director of the Planetary Science Division at NASA Headquarters, explains why the agency decided to delay launch of the Dawn asteroid probe from July to September. Astronomers using data from the National Science Foundation's Robert C. Byrd Green Bank Telescope (GBT) have found the largest negatively-charged molecule yet seen in space. 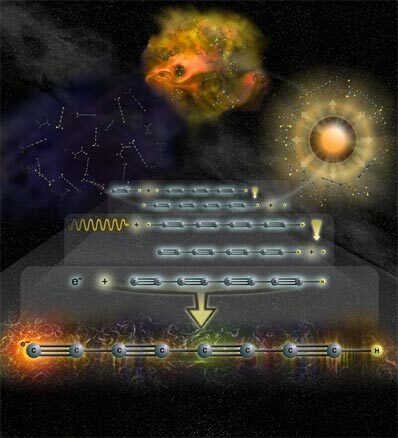 The discovery of the third negatively-charged molecule, called an anion, in less than a year and the size of the latest anion will force a drastic revision of theoretical models of interstellar chemistry, the astronomers say. "This discovery continues to add to the diversity and complexity that is already seen in the chemistry of interstellar space," said Anthony J. Remijan of the National Radio Astronomy Observatory (NRAO). "It also adds to the number of paths available for making the complex organic molecules and other large molecular species that may be precursors to life in the giant clouds from which stars and planets are formed," he added. Two teams of scientists found negatively-charged octatetraynyl, a chain of eight carbon atoms and one hydrogen atom, in the envelope of gas around an old, evolved star and in a cold, dark cloud of molecular gas. In both cases, the molecule had an extra electron, giving it a negative charge. About 130 neutral and about a dozen positively-charged molecules have been discovered in space, but the first negatively-charged molecule was not discovered until late last year. The largest previously-discovered negative ion found in space has six carbon atoms and one hydrogen atom. "Until recently, many theoretical models of how chemical reactions evolve in interstellar space have largely neglected the presence of anions. This can no longer be the case, and this means that there are many more ways to build large organic molecules in cosmic environments than have been explored," said Jan M. Hollis of NASA's Goddard Space Flight Center (GSFC). Ultraviolet light from stars can knock an electron off a molecule, creating a positively-charged ion. Astronomers had thought that molecules would not be able to retain an extra electron, and thus a negative charge, in interstellar space for a significant time. "That obviously is not the case," said Mike McCarthy of the Harvard- Smithsonian Center for Astrophysics (CfA). "Anions are surprisingly abundant in these regions." Remijan and his colleagues found the octatetraynyl anions in the envelope of the evolved giant star IRC +10 216, about 550 light-years from Earth in the constellation Leo. They found radio waves emitted at specific frequencies characteristic of the charged molecule by searching archival data from the GBT, the largest fully-steerable radio telescope in the world. Another team from the Harvard-Smithsonian Center for Astrophysics (CfA) found the same characteristic emission when they observed a cold cloud of molecular gas called TMC-1 in the constellation Taurus. These observations also were done with the GBT. In both cases, preceding laboratory experiments by the CfA team showed which radio frequencies actually are emitted by the molecule, and thus told the astronomers what to look for. "It is essential that likely interstellar molecule candidates are first studied in laboratory experiments so that the radio frequencies they can emit are known in advance of an astronomical observation," said Frank Lovas of the National Institute of Standards and Technology (NIST). Both teams announced their results in the July 20 edition of the Astrophysical Journal Letters. "With three negatively-charged molecules now found in a short period of time, and in very different environments, it appears that many more probably exist. We believe that we can discover more new species using very sensitive and advanced radio telescopes such as the GBT, once they have been characterized in the laboratory," said Sandra Bruenken of the CfA. "Further detailed studies of anions, including astronomical observations, laboratory studies, and theoretical calculations, will allow us to use them to reveal new information about the physical and chemical processes going on in interstellar space," said Martin Cordiner, of Queen's University in Belfast, Northern Ireland. "The GBT continues to take a leading role in discovering, identifying and mapping the distribution of the largest molecules ever found in astronomical environments and will continue to do so for the next several decades," said Phil Jewell of NRAO. In addition to Hollis, Lovas, Cordiner and Jewell, Remijan worked with Tom Millar of Queen's University in Belfast, Northern Ireland, and Andrew Markwick-Kemper of the University of Manchester in the UK. Bruenken worked with McCarthy, Harshal Gupta, Carl Gottlieb, and Patrick Thaddeus, all of the Harvard-Smithsonian Center for Astrophysics. Headquartered in Cambridge, Mass., the Harvard-Smithsonian Center for Astrophysics is a joint collaboration between the Smithsonian Astrophysical Observatory and the Harvard College Observatory. CfA scientists, organized into six research divisions, study the origin, evolution and ultimate fate of the universe.